March | 2015 | cut it out, stitch it up! Jeans – The Last Mile Is The Hardest Mile……. 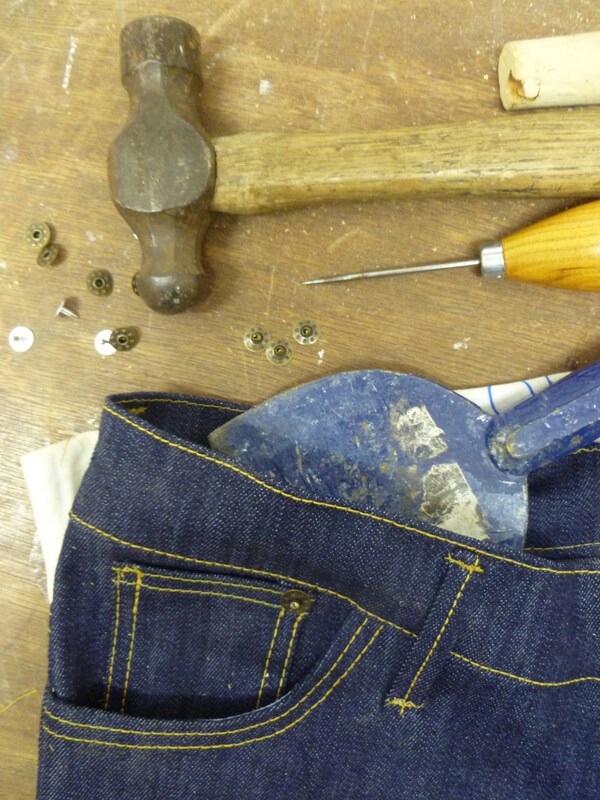 The jeans are finished all bar the rivets. As I planned there were two final evenings of sewing. Putting on the waistband and then belt loops and hemming. I was glad to get to the end of the sewing, at times the top stitching had really tried my patience. I had originally planned to make a two piece shaped waistband but in the course Prof Kenneth cuts a straight piece and shapes with the iron. I thought I’d give it a go. Because my fabric had 3% elastane I stitched a length of organza selvedge to the centre fold inside to prevent the top edge stretching out. It seems to have worked ok but I think next time I’ll try a two piece to ensure I get the right amount of shaping. Applying the jeans button was fine except that because my fly zip guard wasn’t as wide as it should have been the button is quite close to the edge. The last job was applying the rivets. I was really pleased with my eBay rivets £1.69 for 10 but I hadn’t thought about how they were going to be applied. They had quite a protruding knob in the middle which made me think that hitting them directly with a hammer wasn’t going to work. I found a tool in my husband’s workshop which had a hole in which would fit over but I’d still be able to hit the edges. Unfortunately this didn’t work as the post of the rivet would burst out of the front. 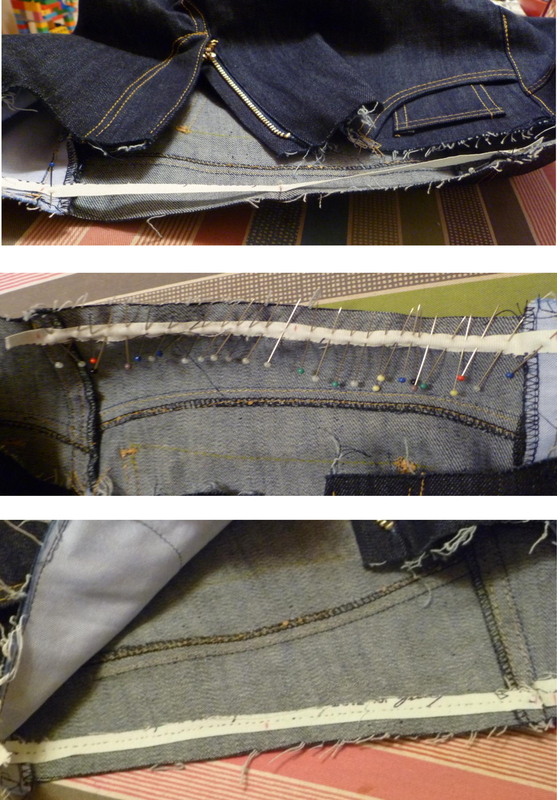 I had come across a post by Taylor Tailor who recommends cutting circles of denim to add thickness before whacking. I managed to apply one OK-ish but when I tried again the cap wouldn’t stay put or the post would come through the front. By this time my stress levels were going through the roof. I only had 10 rivets and I needed 6 good ones. At this point my husband said some wise words “if you’re not happy you’re not going to do a good job”. So I put the hammer down and pulled out the rivet that was in and chucked them in the bin. Back to the internet and I came across this post from Fehr Trade. (Why don’t I research things properly first?) After a night thinking about rivets I decided to order some from the US supplier recommended to get some decent ones. 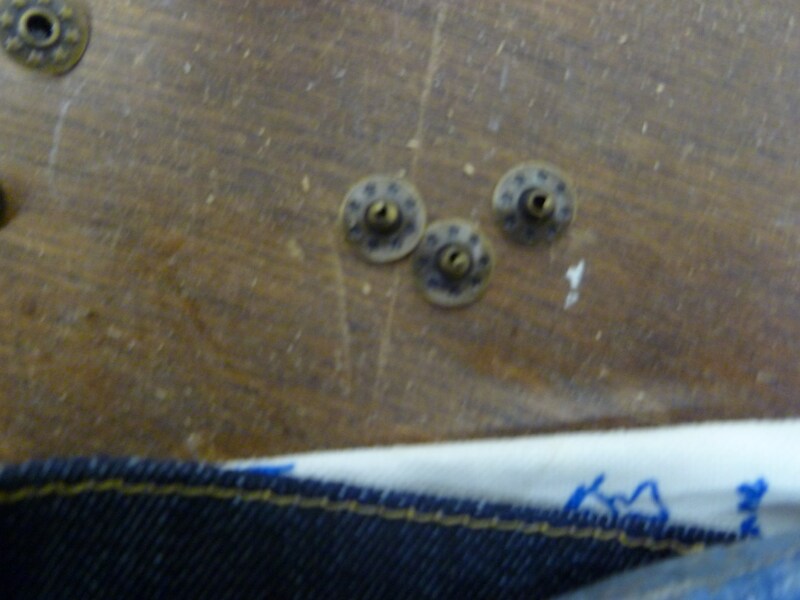 Overseas orders need to be a minimum of $25, so I ordered 100 rivets and 10 jeans buttons – sounds a lot but I do have plans for more jeans. I’m not considering these finished until those rivets are in. They’re hanging up in the wardrobe waiting; every so often I get them out and take a look as I’m really proud of them, the fit is spot on. The top stitching could be better and the coin pocket placement is a bit off but other than that I’d say they were a success. I think the Craftsy Jeanius course is great and would recommend it to anyone. My only comment is to look out for the price. I paid £12.50 on Black Friday, it’s currently at £19 reduced from £29. I’m hoping the rivets arrive before the Easter weekend so I can start wearing and do a proper ‘finished post’. 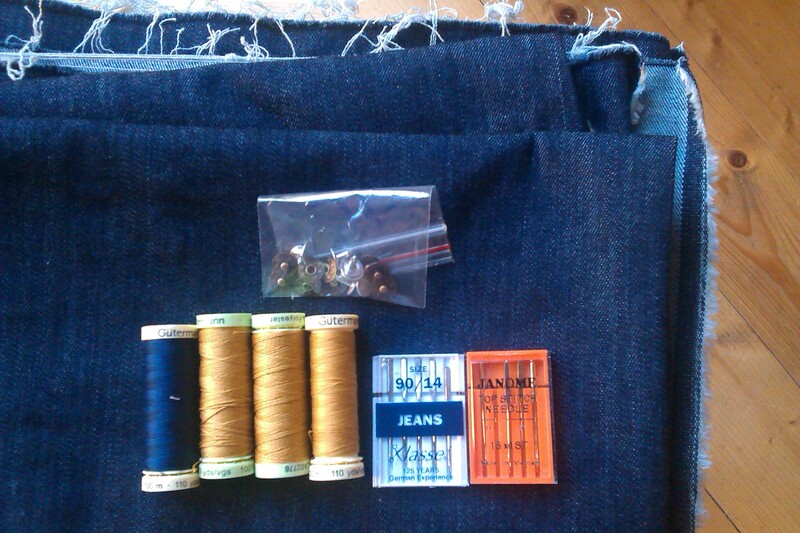 I am pleased to report that the jeans I’m currently making following the Craftsy Jeanius course are going well. I am really enjoying sewing these up. Even though I’m going slow and steady they have sewn up quicker than expected. I just need to put on the waistband, belt loops, button, rivets then finally hem. The top stitching has been only mildly frustrating. My very first stitch using the top stitching thread tangled itself up – but I took a deep breath and stayed cool. I had real problems stitching the edge stitch on the front pocket bags, on the reverse side there are some loops. But strangely the second row would stitch fine. After unpicking a few times I accepted the imperfection as it wasn’t visible on the outside. I’ve even taken the time to tie off all my topstitching thread ends as directed, well all but one and this is what happens when you don’t. I still have to sort this out. 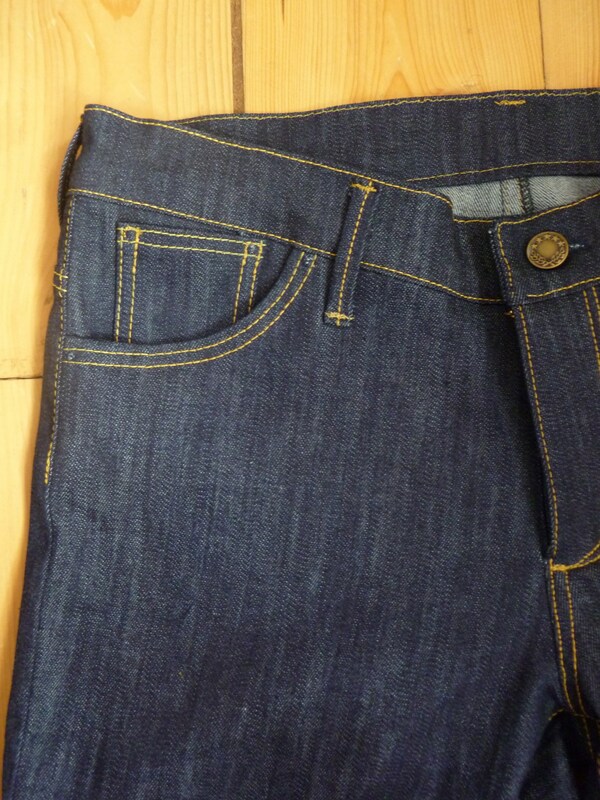 The jeans are fitting well and the small adjustment I made to the front to add some width in has worked. My only issue was with the back waistband as it was still gaping despite the adjustment I made to the pattern after the toile. I then remembered a picture in ‘Claire Shaeffers’s Couture Sewing Techniques’ where a gaping low ‘V’ neckline had the excess taken out of it by using seam tape. I needed to remove 1.25cm from each half of the back yoke. They were measuring 21.25cm and wanted to get to 20cm, so I found some tape to use (selvedge cut off some quilting cotton). I marked a 20cm length also noting the mid-point. Then I pinned this to the yoke just inside where the seam would be sewn using lots of pins to spread out the fullness. I then stitched the tape on using tiny running stitches. I treated each yoke section separately. Once the tape was on I steamed the fullness out and double checked that they still measured 20cm. This has really improved the way they fit at the back waist. I’m not quite sure what to do next…I think the tape should stay on, maybe trim it down a bit as I don’t want it to show once the waistband is on. Let me know if you know the best way to deal with this! For my first attempt at a fly front I’m really pleased at how it has turned out. The instructions are really clear but there is room for improvement the next time I do one. You can see from the picture that the inner zip guard is too short and not quite wide enough. I needed to make my pattern pieces bigger. The inner guard should reach as far as the twin needle stitching so that it can be secured with a bartack at the bottom. 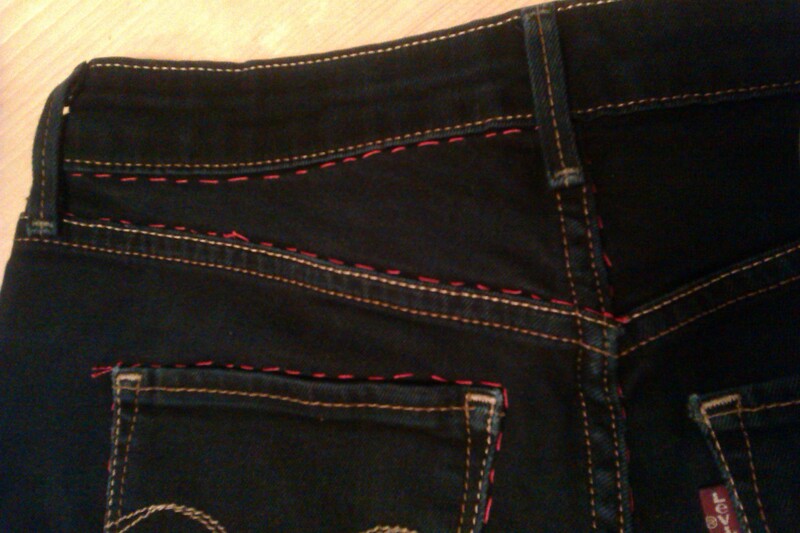 When you look on the right side of a pair of jeans this bartack sits on the twin needle just at the bottom curve. I mentioned in the previous post that I was going to do a two piece waistband so I could get the shaping but in the course the waistband starts off as a folded straight band but then is shaped, stretching and curving the bottom edge slightly with the iron so I’m going to give this a go. 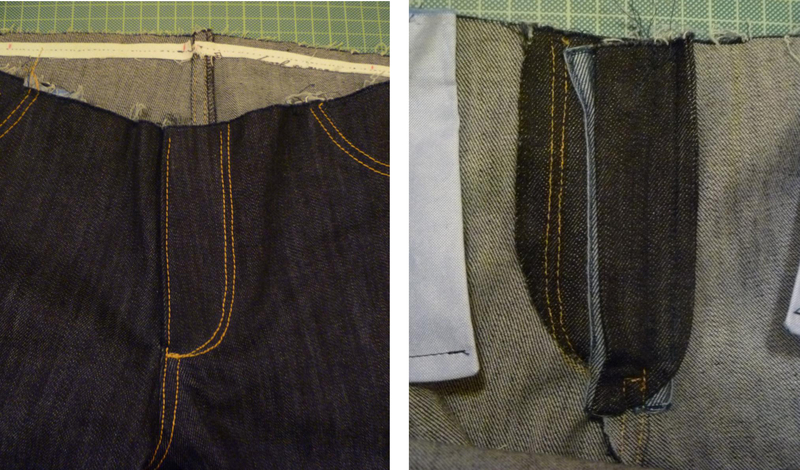 Since joining the RTW Fast in January 2014 I knew that to keep up the fast I’d need to make some jeans sooner or later. So I’ve been thinking about this for a while, I finally bought the Craftsy Jeanius course last November when on Black Friday it was on offer for £12.50. Craftsy regularly have offers but this was the best I’d seen it at. Last week I finally got my act together and started the course. To me the idea of jeans just looked too intimidating – all that topstitching, I’ve never done a fly zipper opening and (most importantly) getting the fit right. I’m really enjoying the course, it’s hosted by Kenneth D King and I find his delivery clear and thorough. I like how his ruler has ‘prof King’ stuck to it. 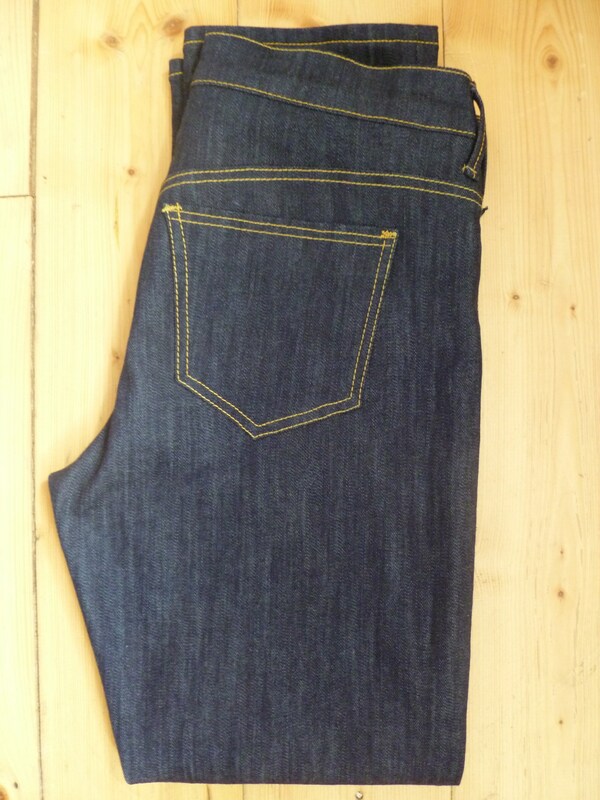 The jeans I wanted to copy are a pair of Levi’s straight leg demi curve which fit really well. The problem I normally have with jeans and any trousers is the gaping at the back waistband. These jeans are perfect and I can wear them without a belt. I spent a couple of evenings thread tracing the seam lines then transferring on to the silk organza and finally transferring on to pattern paper. The word that stuck in my mind from the tutor was ‘accuracy’, so I made sure I spent time measuring my seam lines and making sure they matched up. The toile was easy to sew up as you make this before you’ve added any front pockets to your pattern. You do need to put a zipper in and it’s optional whether you want to add a waistband, which I did. The original jeans have 2% spandex and the denim I have bought has 3% in but my toile fabric is 100% cotton. I managed to wriggle into the toile but couldn’t do the zipper up, but could just about close the waistband at the front. Ignoring the zipper issue the fit around the bottom and thighs is perfect, slightly tight but expected without the spandex. 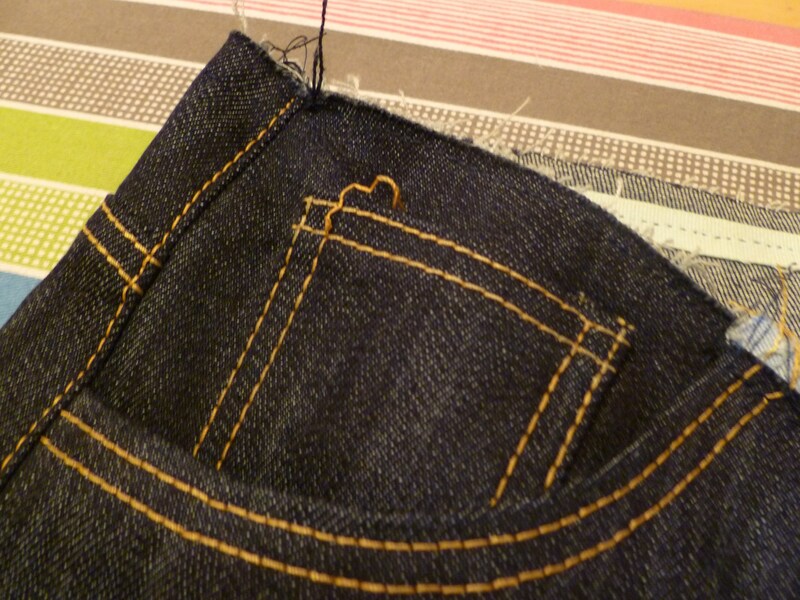 The back waist has a tiny bit of a gape but taking a closer look at the waistband on the original jeans it is shaped as the length of the top edge is slightly shorter than the bottom edge. Shaping the waistband should eliminate the gape but just to be sure I’m going to take tiny bit out of the top edge of the back yoke. I needed to add some width to the front body as even with spandex that zip wasn’t going to close. 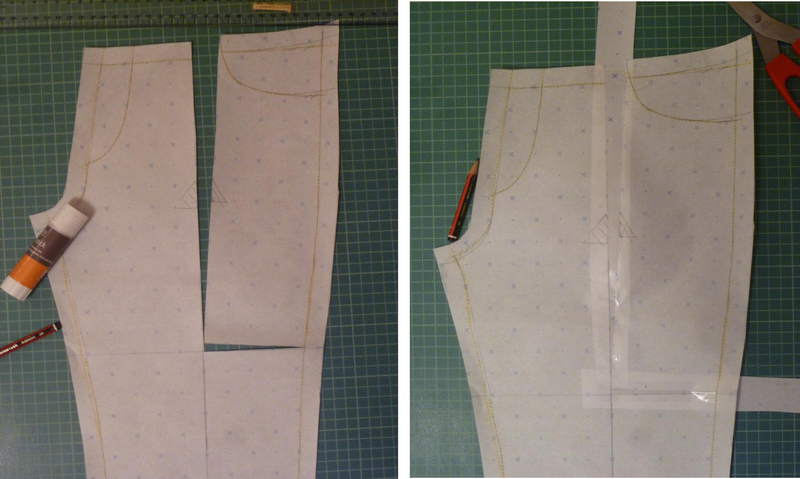 I added 1.5cm into the front pattern piece at the waist by drawing a horizontal line at mid thigh height then cutting in a straight line down from the waist to this line then out to the side seam. I opened up the pattern at the mid thigh by 0.5cm, this then gave an opening at the waist of 1.5cm. I filled in the opened up wedges by sticking pattern paper on the reverse. I bought the silk organza from e-Bay. I’ve used this seller before for organza and the delivery from Hong Kong is always quicker that you expect. I didn’t buy the denim until I’d gotten far enough in to the project and knew I wasn’t going to give up. I’ve bought denim from Ditto Fabrics before so this was my first point of call. 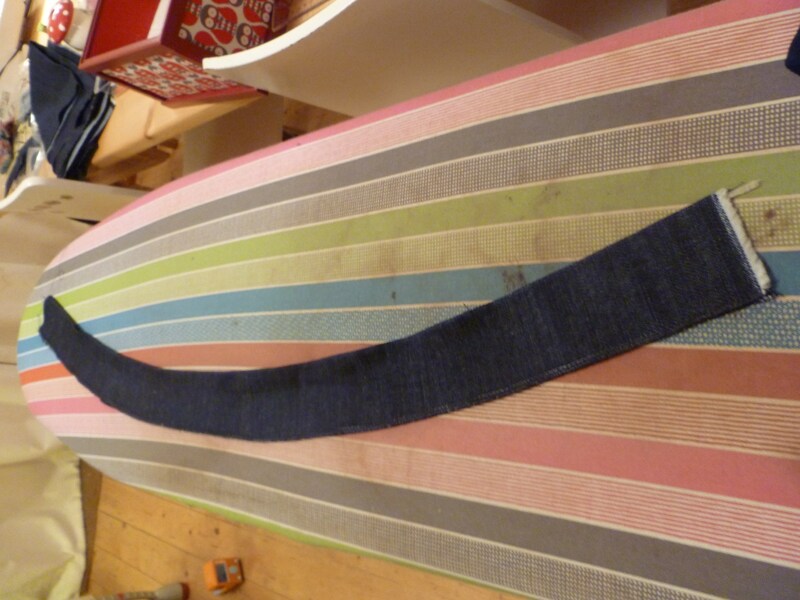 I ordered a swatch of the Italian denim at £8.25 per metre. 97% cotton / 3% spandex. The weight is just slightly lighter than the Levi’s but I really liked the colour so instead of messing about and getting more swatches I went for it and it arrived the day after ordering. Because a lot of their fabrics are ex – designer clearance I didn’t want to faff around and then find it’s sold out. So I feel ready to start…. I have some orange Guttermann topstitching thread already – two spools – as in my experience you get through a lot of this when trying to get the tension right. I always use a matching colour normal thread quality in the bobbin; since I’ve learnt this trick my top stitching experiences have been less fraught. For some great topstitch advice read this post from ‘yes, I like that’. I’m going to pace myself with the sewing and not try to do too much in one sitting but I have to say I’m quite excited about making my first pair of jeans. When I was procrastinating over the shift dress I was planning, I needed a quick and easy make for distraction. I made up a long sleeved Sewaholic Renfrew with the cowl neck. Back in the Autumn I’d made this version for the first time using black wool jersey. I’m always on the lookout for good quality single jersey in knitted stripes – yarn dyed rather than printed. This fabric is 95% viscose 5% elastane. I had seen similar fabric on e-Bay but wasn’t sure what to expect as I usually go for cotton single jersey. When I saw this fabric in Leon’s in Chorlton for £4.99 a metre I thought I’d give it a go. It has a lovely slightly slinky hand feel and sews up just fine. I cut this top out one evening then stitched it up the next. I used the 4 thread overlocker for everything except for stitching in the clear elastic at the shoulder seams and the zig-zag top stitching around the cowl neck. As with the other times I’ve used the cowl neck pattern, I cut the whole cowl in one piece without the seam at the fold line. There’s not too much to say about this top except that in the few weeks since it’s been made I’ve probably worn it the most out any other garment. It goes really well with the dark red ponte skirt I made last November. When I finished that skirt I wasn’t quite sure about it but that has also had so much wear but the cheap quality of the fabric is beginning to show and it’s looking quite bobbly. March is going to be spent working on jeans. I’m getting into the Craftsy Jeanius course and the pattern has been made and toile sewn up. So far so good, and the denim arrived today and has already had a pre-wash. Let’s hope I can keep up the enthusiasm.